It is bold blue or bold yellowish and it wasn't there not so long ago, at least for me. So is it possible to have a setting somewhere to explicitly say: Don't show "looking for a job?". I'm not looking for a job and since you changed the site. When it is showing the first thing my eye see is that bold box on the right side. Also I'm used to see Hot Question right there. You're seeing our Stack Overflow Careers ads, because they have no dancing monkeys, hula girls, or "marching ants" borders, so AdBlock Plus put them on their "unobtrusive ads" list. Now, Careers job listings help us keep the LEDs on, and we've worked hard to never allow any that wiggle, dance, encourage harming monkeys, or take their clothes off. Plus, we're working hard to show you jobs that might actually excite you. You're welcome to have Adblock Plus block these, too. We'll even show you exactly how. It'll look like you've blocked only one color ad ("blue" or "orange") but in our tests, it covers both. At the end of the day, we think it's our job to serve you ads that may actually be useful to you, but anything that makes it harder for the kind of users who post here just isn't worth it. I've also only started seeing this. Last week I cannot remember it being there at all, despite other questions about this being created many months ago. I'm always open to being made aware of jobs in my area - even if I'm not especially looking for a change, but I don't want this forced upon me. It should be my choice. 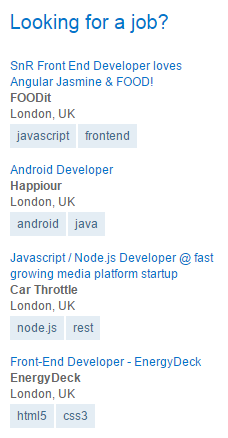 Most of the jobs listed do not appear to be at all relevant to my skillset. In the screenshot I've posted below you can see the Android Developer job - I have both the android and java tags toggled as ignored. Why am I even seeing this? 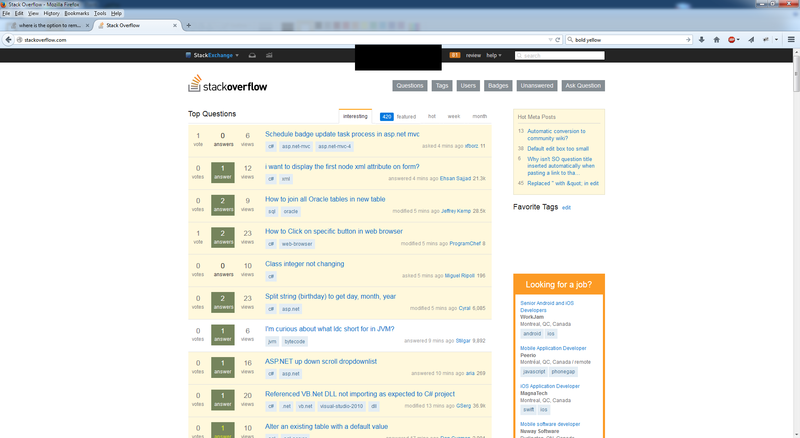 It's incredibly intrusive on my Stack Overflow experience. The background is unnecessarily dark and it doesn't even load at the same time as the other elements within the sidebar. If I refresh the page, I see my favourite tags and the hot network questions list, then all of a sudden this jobs box appears between the two. I hate to say it, but even though I'm a frequent user of StackOverflow's Careers site, upon navigating through around 10 pages I've been forced to block the Looking for a job? box with my browser's ad blocker. It's just far too much of an annoyance in its current state. Why can't it just look like this? I'm guessing you're a user of Adblock Plus? It seems the jobs sidebar ad was recently added to the whitelist. If you turn off ABP's "Allow some non-intrusive advertising" option, it will be hidden again as it was before. If you want to suggest specific changes, I recommend asking a new question. An option to remove the ad entirely is almost certainly not going to happen. I'm a Stack Exchange employee and I also see these ads every time I load up Stack Overflow and Server Fault. Unlike our regular ads, there's no privilege level to reduce the number of Careers ads. I've only been at this job for a year and a half and have no desire to change employers right now. Even if I did, I'm not often enticed by the listings I see. So I sympathize with your annoyance. The specific thing you are asking for, an option to remove these ads altogether, is unlikely to happen. Partially that's because the revenue from showing Careers ads helps pay our developers who add new features, fix bugs, and keep our servers running efficiently. But the larger reason is that we really do want to help every developer have a better experience at their job than they do now. Joel talks about Stack Overflow being programmer Jerusalem. 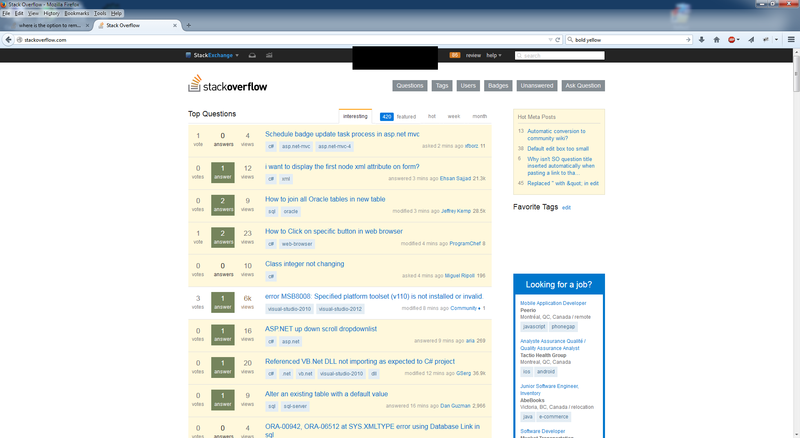 Metaphorically speaking, we think Stack Overflow can be a place where all programmers gather and find security. In one way, our existing collection of questions and answers does just that. We as a community haven't solved all our problems (nor are we likely to), but Stack Overflow has succeeded in drawing all sorts of programmers and giving them practical professional guidance. It's a minor miracle achieved by thousands of user-moderators. But that's not really enough. While it's great you no longer need to spend days or weeks searching for some poorly documented feature or tracking down some tricky bug, many of you still work out of an open office plan. Many of you are required to waste hours of your life travelling to work rather than working remotely. Many of your employers pinch pennies by not providing the tools you need to do your job. We honestly believe that Stack Overflow Careers can help. In my own experience it's easy to get settled in a good, but not great programming job. As an intern, I had a private office, flexibility in choosing the technology I worked with, access to well-configured computers, and managers who left technical decisions up to me. Over the course of 15+ years at the same job, cost-cutting and changes in culture slowly eroded those "perks" to the point I was miserable and unproductive. It's easy to blame my former employer, but as a professional in demand, it was my fault for not speaking up or seeking a new position. You can read about improved targeting being developed by Kevin Montrose and Jason Punyon. We are looking into ways of helping you find jobs with the benefits you are actually interested in. * We will be watching the responses to our annual survey to improve our Careers product. While there are succes stories, there is still a lot of work left to be done. At least for the moment, one of the few tools we have to connect employers to great programmers is sidebar ads. * Looking through random listings just now, I found a job that advertises it's "Doggie Friendly". That's a benefit I'd never known existed if I hadn't stumbled across it. There's got to be a way of matching employers and candidates who care about unusual benefits like this one. I use AdBlock Plus. I just discovered that I could get rid of this by using its "Block Element" feature. Click on the ABP icon, select Block Element, dismiss the menu, then click on the blue border around the job ads. Note that I did it this way since unchecking the "Allow some ..." option didn't work. In AdblockPlus, click on "Filter Preferences..."
In AdblockPlus, if a filter rule starts with @@, then it is an exception rule, that lets ads through rather than blocking them. So, you want to find those exceptions, and disable them. That will allow AdblockPlus to block the "Looking for a Job?" ad. Not the answer you're looking for? Browse other questions tagged feature-request advertising jobs . Why not - subscription / job ads - option for users? Is “Please, don't show this ad again” button cookie-based? Could it be user-related? Job listings for part-time or freelance help? Does Stack Overflow deliberately show more job ads to me when I'm browsing from work? Can we make finding duplicates better in the close window?